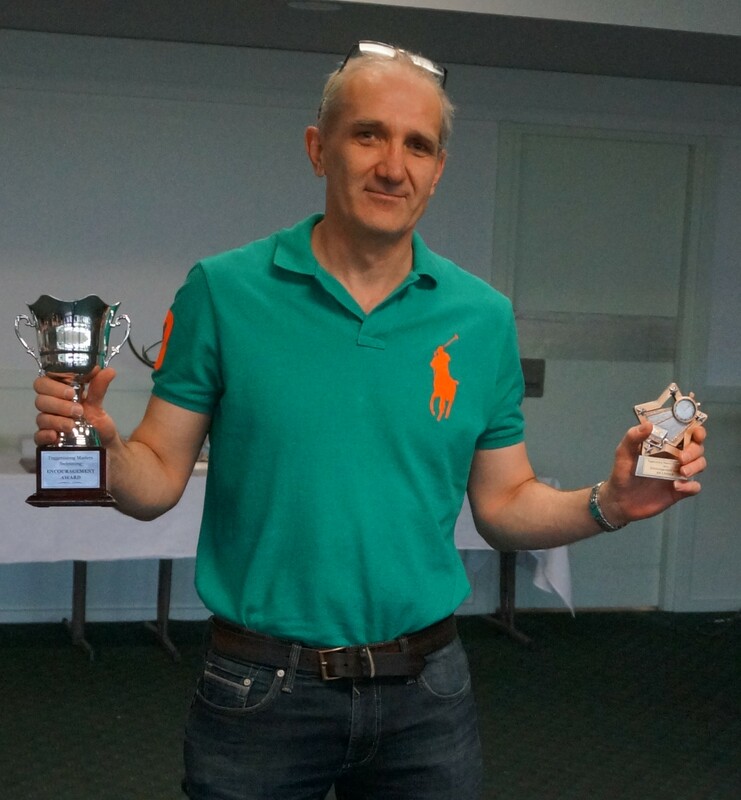 2015 Annual Club Awards – What a year 2015 was! 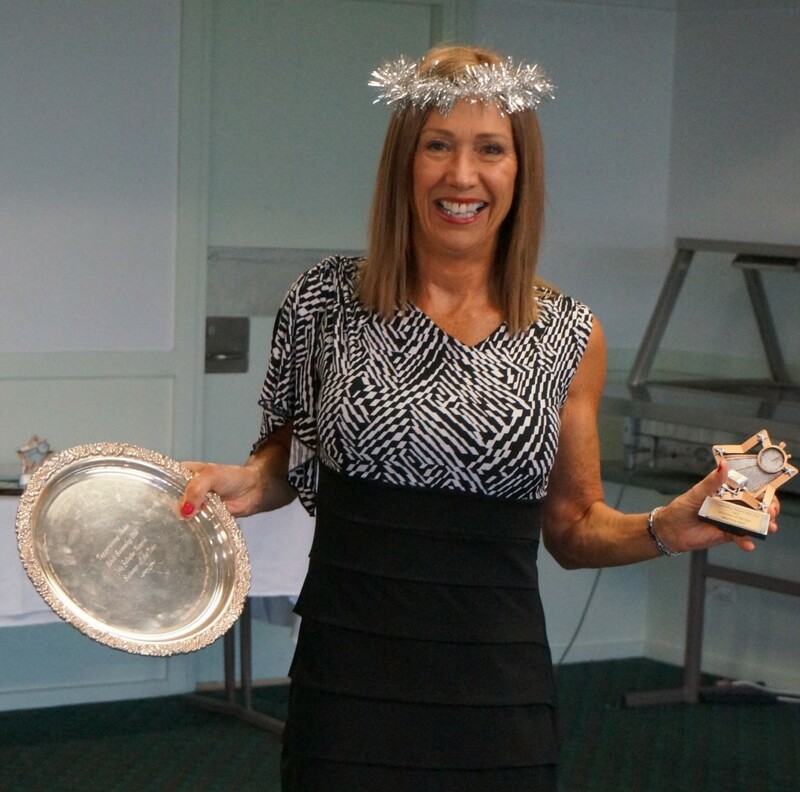 Our 2015 Club Christmas Party/Presentation Night was held at Tuggeranong Vikings Club on Sunday 13 December 2015. 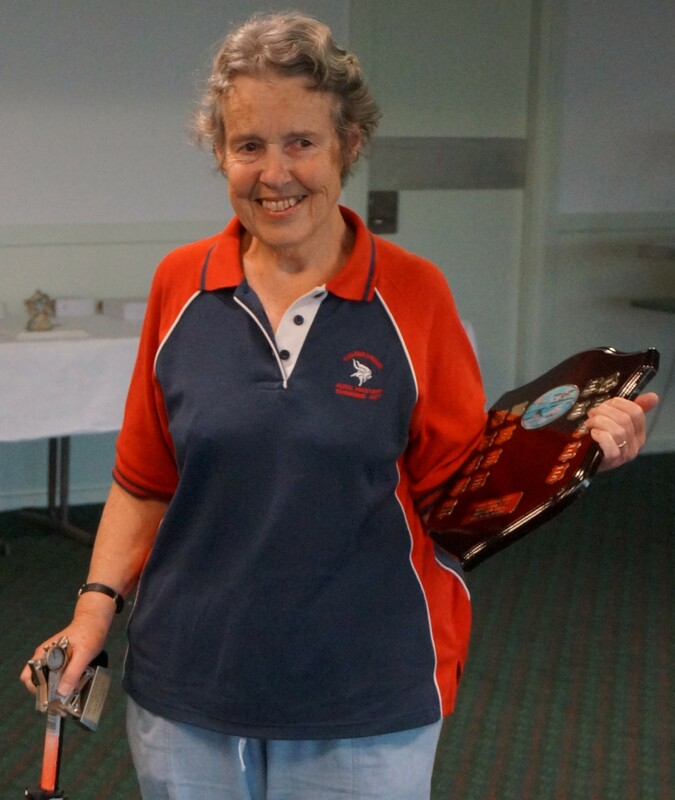 Our club President, Leisa Cass, once again spoke about our continued successes as a club over the last 12 months and presented the perpetual club awards/trophies to this year’s winners. 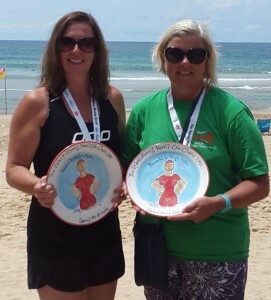 In January and February we had swimmers successfully taking on the open water swims at Tathra Wharf 2 Waves, the Cole Classic and the Sri Chinmoy Lake Swims with many podium placings in these events. We do love a challenge out of the pool and we again saw some of our members tackling the short and long course events at the Husky Triathlon Festival. We hosted the first ACT Interclub for the year in March with a huge turn-out of 49 swimmers competing. Tuggeranong came out winners on the day ahead of Molonglo, Picton and Ginninderra. 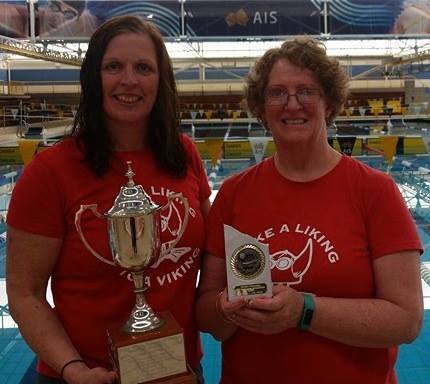 Also in March, many of our members competed at the NSW State Long Course Championships at SOPAC, where we won the Biddy Hall Trophy for highest average points per swimmer at the meet, and finished 5th of 38 clubs overall and Anne Smyth was presented with the 2014 NSW Masters Swimming Coach of the Year award. Finally in March, we saw the 2014 Endurance 1000 results announced where we placed 4th Nationally and 2nd in NSW, swimming a total of 755.6km and amassing 13,312 points. 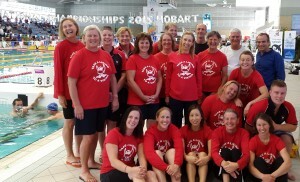 April brought around MSA National Championships – held in Hobart and in Short Course format for a change. They turned on great weather for us – and we responded by turning up the heat in the pool, coming away with too many medals to count and in excess of 60 new club records. We placed a very impressive 6th out of 94 clubs and 2nd from NSW with 20 swimmers, compared to some clubs ahead of us with 30 or 35 or more swimmers. Anne Smyth was also presented with the National 2014 Masters Swimming Coach of the Year award - a huge recognition of the work the club has been put into developing swimmers and the success they have had competing. 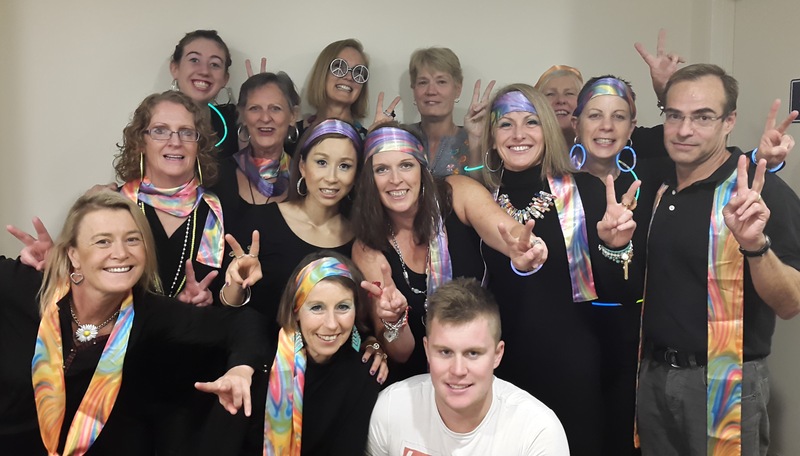 June brought on the second ACT Interclub hosted by Molonglo. This meet brought out 36 keen swimmers for a long course event. Tuggeranong again came out ahead on points from Molonglo and Ginninderra. July saw the organised chaos that is the NSW State Relay Meet at SOPAC. Despite what does seem to be chaos, everyone knows where they need to be, who is in their team and where those swimmers are if they are not in marshaling already. We placed 7th from 14 clubs, and initiated a few new swimmers into the world of racing and competition in the pool. 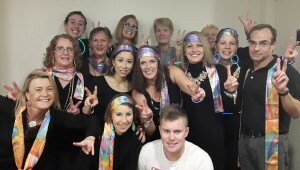 We celebrated the ‘zero’ birthdays in August with a great night out with swimming buddies, that didn’t involve a 3-4 hour drive or any swimming. Quite a novelty for many of us. In August a team of nine headed of the NSW Long Distance Short Course Championships. With 32 clubs represented, we managed to scrape ahead to win the Championship by 20 points. With a total of 160 points, we averaged just under 18 points per swimmer from a possible 20 points per swimmer. 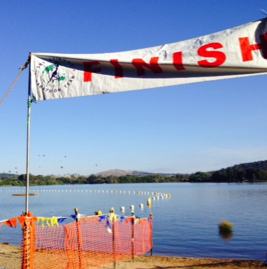 September had us running the Tuggeranong Challenge at the newly re-opened and re-furbished Lakeside Leisure Centre. It is quite an effort to make these events come together and again – thanks to all who helped with this. Anne Smyth won the Challenge with an overall time difference of only 1.34 seconds across three swims. 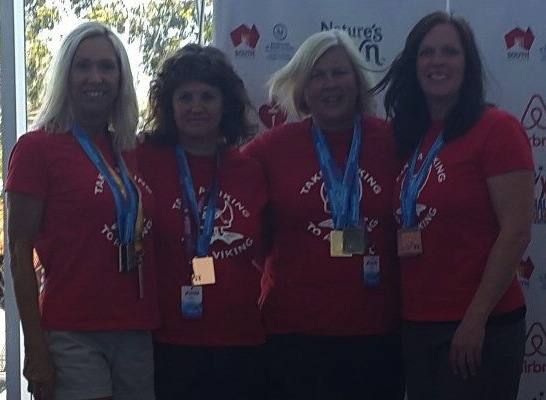 October and four of our ladies travelled to Adelaide for the Australian Masters Games and brought back a swag of medals for their efforts in the pool. 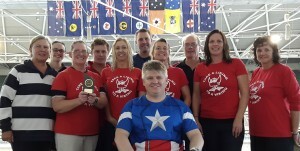 Also in October the NSW State Short Course Championships, held at the AIS in Canberra, was a highlight for our local calendar and a dominating event for Tuggeranong. With 26 swimmers crushing PB’s all over the place, during time spent manning the medal table both Saturday and Sunday, it seemed that about every second medal went to a Tuggeranong swimmer, and this was reflected in an almost clean sweep of the trophies. We were presented with the Championship Award for overall winner with 1264 points, 1160 points clear from the 2nd place team, the Harry Fowler Trophy for relay team 200+ (Caroline Makin, Nicolee Martin, Anne Smyth and Katrina Burgess) and the Gordon Cozins Trophy for highest point score in the relays. So that’s three of the four team trophies that came to our club! November saw the third and final ACT Interclub for the year. With some mad last minute re-shuffling, we managed to secure Gungahlin Leisure Centre for us to host the meet at, due to ongoing water temperature issues at Tuggeranong. With only a total of 28 swimmers, it was the smallest ACT Interclub for the year, but no less competitive. 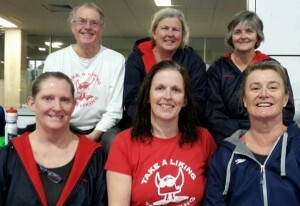 Quite a few new club records came out of the afternoon of swimming and the overall result was Tuggeranong 1st to clean sweep the ACT Interclubs for 2015. 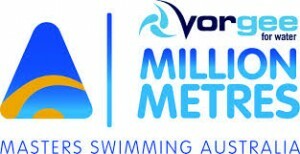 One Million Metres – Leisa Cass and Two Million Metres – David Bale and Ann Reid and Caroline Makin. This award is for a Thursday morning swimmer who trains regularly, takes instruction and applies it to the best of their ability, and just plain tries hard but has fun too. 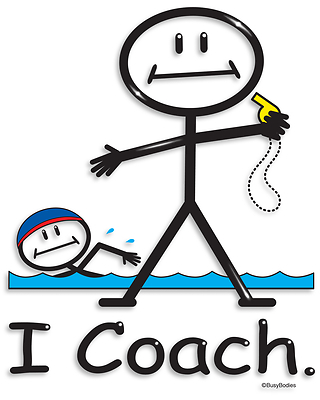 This award which was introduced last year is for an evening swimmer, who again trains regularly, takes instruction and applies it to the best of their ability and tries hard but has fun doing it. The 2015 winner is Ed Linder. Ed has only been swimming with us for a short time. In fact he turned up for the first time during our temporary relocation to Grammar. He tried hard and got through his first session in lane one, but was somewhat ‘stuffed’. He is now training regularly in Lane 3 or 4, and while still building his overall swim fitness, speed has certainly come his way with some pretty damn quick times at the Challenge and State SC. Well done Ed and keep up the hard work! 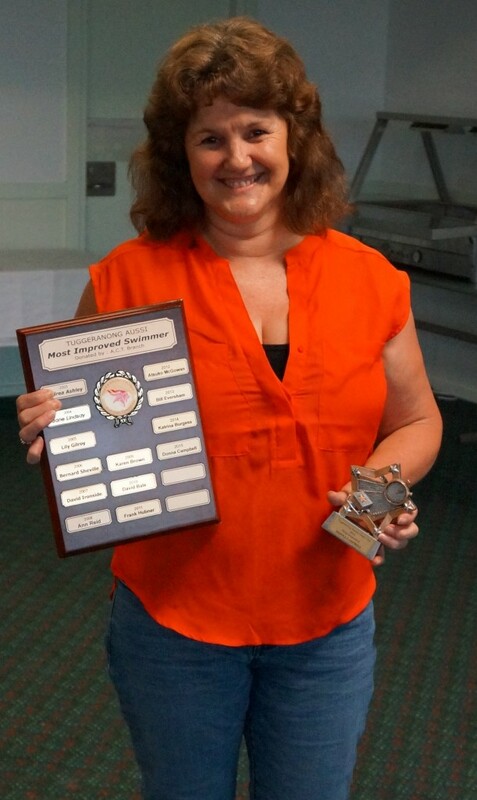 Most Improved Swimmer for 2015 goes to Donna Campbell. 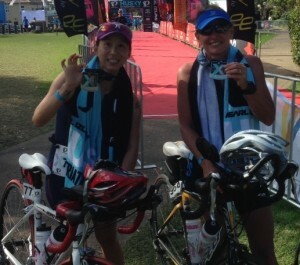 Donna has been competing regularly during the year and has continued to improve her times on nearly all every swim. She’s keen to have a go at all strokes and distances and is keen to get involved with whatever is happening. Well done Donna. The winner for 2015 is Ann Reid. Ann has always been a keen participant in the postal swims that are available throughout the year, and as they always tie into the Endurance swims as well, she more often than not gets two swims for one lot of effort. That’s smart swimming and a well deserved winner. 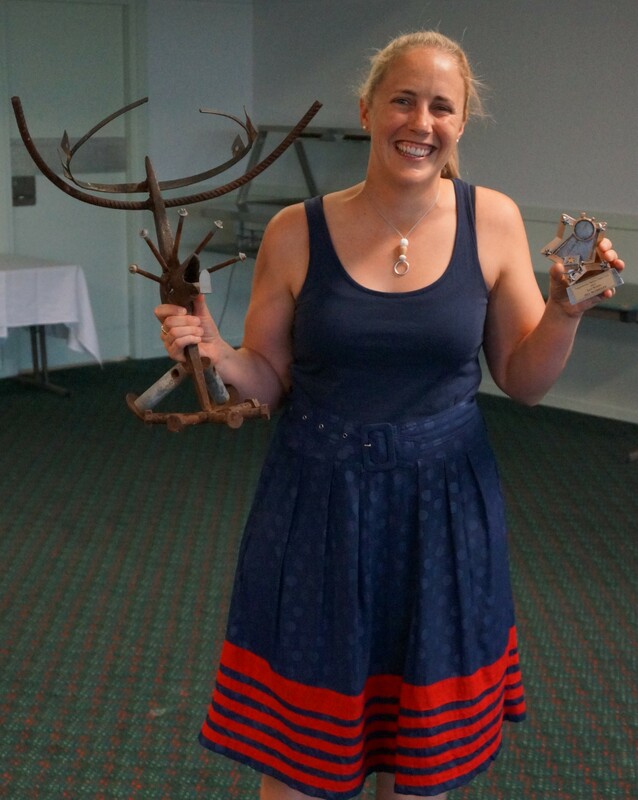 This year’s Iron Person is Jill Blomeley. Jill has had an interesting year. With some health issues and then a major knee injury, she has continued to train when she could. This included turning up with a knee brace on, taking it off, doing the entire session as pull, and then putting the knee brace back on before hobbling back out the door. Now that is commitment and deserving of the Iron Person award. 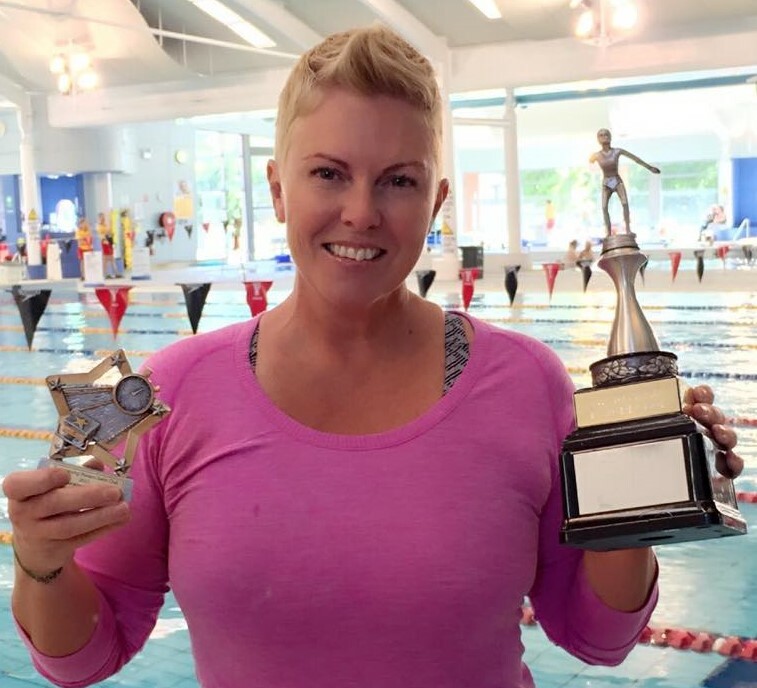 The 2015 Swimmer of the Year is Brenda Day. Brenda has been completed – according to the MSA results portal – 140 individual swims this year. She swam the highest distance of all swimmers from our club at Nationals with a total of 2,750m of racing. She has 10 Long Course top 10 rankings and an incredible 29 Short Course top 10 rankings. An amazing effort and a well deserved recipient of this award. The 2015 Club Person of the Year was a difficult choice in some ways, as there a few who we would have liked to acknowledge, but in then in the end the decision was not that hard. The winner this year is Jane Lindsay. Jane has not been swimming much the last couple of years, but as a keen Endurance swimmer, she has kept up an ongoing interest in the program. So it is for all the work that Jane has done to set up the individual spreadsheets and record all our Endurance swims in the national not very user-friendly system, that we recognise Jane today for all her time, effort and ongoing support of the club over many years. Thank you so much Jane, a very deserving recipient. Thanks to the coaching team of Brenda Day, Leisa Cass, Kade Burgess and Caroline Makin - led by Anne Smyth, the coaches have all worked hard to provide positive and meet focused training programs during the year, and yet again this is reflected in how well the club has performed and individuals have improved across the year. … and to our Committee members ….Thank you to all those who put up their hands to continue in their committee roles or take on a new role, and a special thanks to those new people who have taken on a role to help support and run the club. A big thank you to Bill Eversham, Jon McRae and Ann Reid for their support over the past years volunteering their time to help run the club. Please think about how you can all help during the next year with supporting your club to continue to be the amazing and successful Championship winning club that it is. Thanks also to Scott Makin as ‘official photographer’ for the awards event.